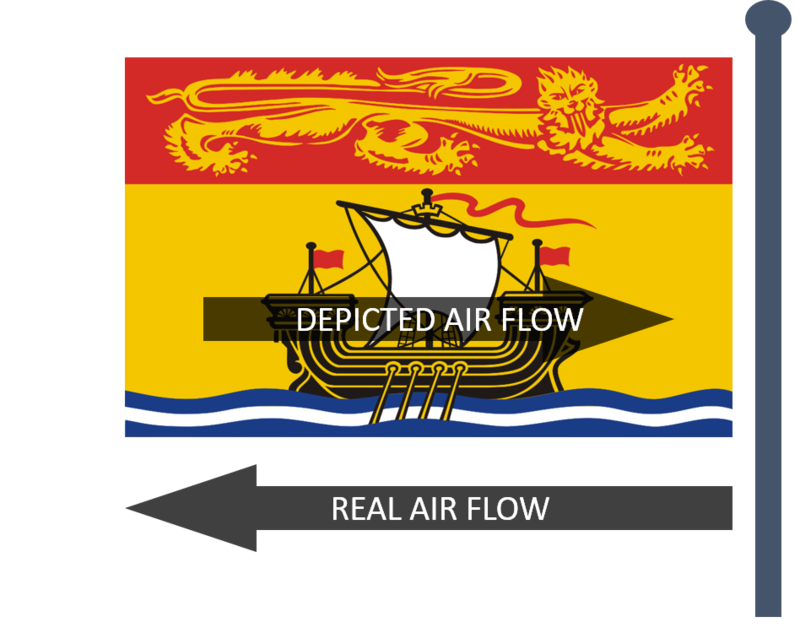 The province of New Brunswick has a fine heraldic flag, depicting a ship (a three-flagged, single-masted, oared galley called a lymphad, as traditional in Scottish heraldry) beneath a fantastically elongated golden lion passant (a symbol of the Canadian monarchy, and of German Brunswick) . What’s wrong with this picture? You might point out that lymphads have never been used in the Maritime Provinces, and that monstrous gold lions are seldom seen in apocalyptic red and yellow skies over Moncton. And you would be right. But that’s not what bothers me about this flag. I rather like the psychedelic heraldic imagery. Heraldic artists are entitled to artistic license. 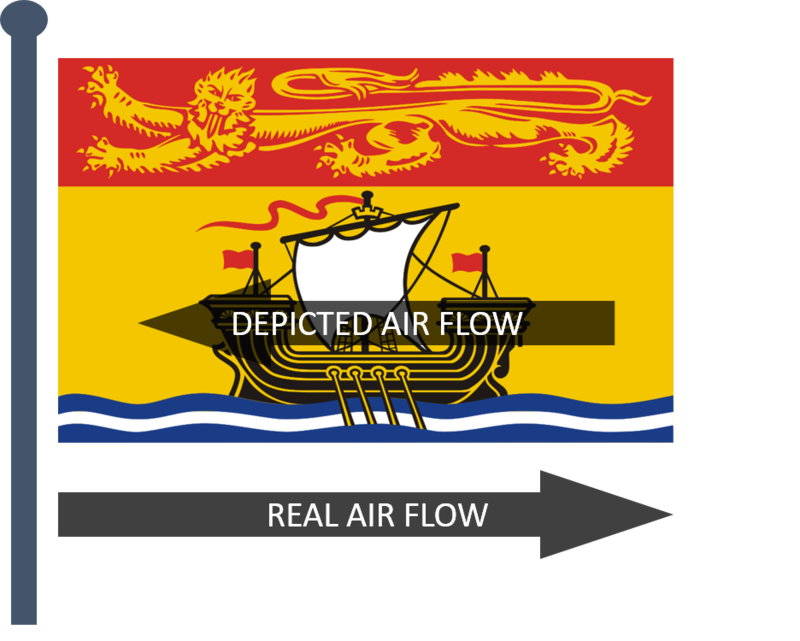 The New Brunswick flag with the lymphad turned around. Well, in addition to now somewhat awkwardly presenting an apparent chance encounter of an aerial lion headed to the left with a ship headed to the right, this would violate the heraldic principle that the direction of honor is away from the sinister (to the observer’s right) and towards the dexter (to the observer’s left). Turning the ship around would suggest it was, like Sir Robin in Monty Python and the Holy Grail, bravely running away, not forward. The US flag on the right side of Space Shuttle Endeavor. This need to show vehicles (and people, and animals) facing into the wind only comes into conflict with the way the wind itself needs to be depicted on the flag when the vehicle is understood to be pushed by the (imaginary) wind. Take away the sail, for example, and the problem goes away — the imaginary wind can be shown to be moving in an anti-heraldic direction, consistent with the real wind, and (hopefully?) not raising any heraldic hackles. However, the question of which direction is perceived as forward on a flag is larger than the particular problems depicting sailing vessels presents. But that is a subject for another time. I’m not a sailor, nor will I ever be, but I’ve seen the way some sail effectively into the wind by tacking. I suppose this sort of tub couldn’t be made to do that. What I find to be unusual is that heraldic charges are normally isolated on a field or smack on a partition between fields, not pictorially integrated like this one. 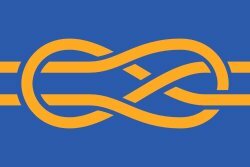 The flag with ship and water adopted by Bath, Maine, follows the rule more strictly. That flag has two flags on it! That shows why such flags are BAD. If the flag was a proper flag, it woudn’t have boats and lion on it. Great flags are abstract. The sails and flags are correctly depicted with a wind from right to left (facing the picture). A sailing vessel not under power (not accounting for oar action in the picture) will not sail fast enough to “outrun” the wind pushing it along, therefore, the flags and ensigns will point in the direction of the vessel’s travel. . . .